If you live in Toronto, you’ve probably heard about the new WE Store – your destination to shop ME to WE products and get involved in the Keilburgers’ non-profit movement that’s changing the world. The store is located in the Toronto Eaton Centre, and offers an interactive experience. Shoppers can purchase the products of artisans in third-world countries, and see the direct impact of their purchase through virtual reality goggles. When you walk in the store, you are overcome with a sense of calmness as you take in the intricate crafts, woodwork, and calming blues. This effective interior design is the work of Designstead, the Toronto-based firm commissioned to design the first-ever WE Store. We recently sat down with the agency to learn more about their team, and what it was like to work on this project. Image of WE Store, located on Level 2 of the Toronto Eaton Centre. TO DO: Can you tell us a bit more about Designstead? Designstead is a Toronto-based full service commercial interior design firm that specializes in spaces that serve the highest level of human experience. We believe that space and design in general should strike an emotional chord with engaged users. The firm was founded by Jeff Wortley, Bradley Marks and Andrew Gallici in 2013, and focuses primarily on retail design. Our current clients include Simons, TELUS, Koodo, WOW! Mobile, Andrews, Town Shoes, DSW and WE.org. We’re a casual and intimate studio of 6 to 7 people, and our team is a cross-section of interior designers, all who studied in Ontario; at Ryerson University, St. Clair College and Sheridan College. TO DO: Please tell us about Designstead’s work on WE Store. How did this collaboration come about? We came to work with WE.org the way we have come to work with the majority of our clients; through referral. WE was referred to us both by Cadillac Fairview and TELUS. Ultimately, we work for and with people; so this double referral was a great honour! TO DO: What excited your team about working on this project? Is it different from projects you’ve done in the past? Our relationship was christened just before Christmas 2015 when Roxanne Joyal, CEO at Me to We (the social enterprise arm of WE.org) phoned us. Her passion for the work they do was infectious! And who doesn’t want to make this world a better place? She had us at “Hello”, as the saying goes. Our office is quite a young group and we were all aware of the good work the Kielburgers do with WE.org and Free the Children. WE.org is a movement of empowerment to change the world and we were swept into it. TO DO: How is Designstead involved in Toronto’s design community? As a design studio, we love brainstorming with like-minded designers and artisans. We often engage with local partners to bring creative installations to the spaces we create. 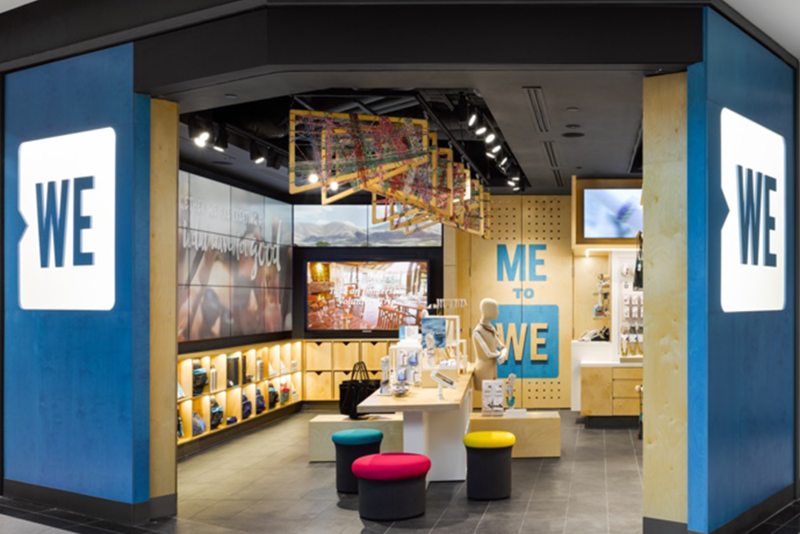 The WE store is anchored by a ceiling installation of Rafiki bracelets (a mainstay of Me to We) which was co-created, fabricated and installed by Christina Ott at Crow Design. Designstead continually participates in the design community with a large focus on students and institutions: we are often invited to lecture, critique and meet with students. Giving back is important to us. We are huge advocates of creative stimulation, problem-solving and arts-based education in general. We feel incredibly blessed in our 3 short years of business to have sponsored local art-based charities such as Sketch.ca, Arts Access Fund and Kids Up Front. Our founding partners are also very ingrained in the community. Bradley Marks was a jury member for the 2014 TODO Festival Awards and participated in the Digital Main Street Design Charette in 2015. The program and app launched this summer. Jeff Wortley sits on the Academic Advisory Committee for Interior Design at St. Clair College. Andrew Gallici has been a past board member at ARIDO. Click here to learn more about Designstead, and visit the WE Store in the Toronto Eaton Centre today!